Bear Mountain has been kind to me in the past. 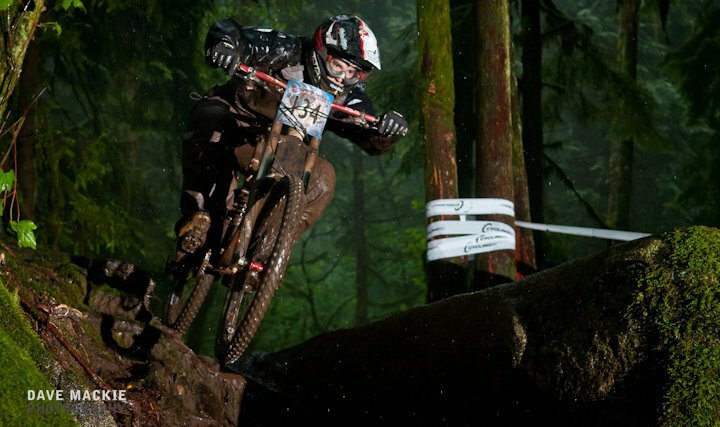 My best result as an Elite racer came at Bear Mountain back in 2008 when I finished 2nd overall. I’ve been riding well lately, feeling fit, and was looking forward to a positive result at Bear this week-end. Mother Nature didn’t really want to co-operate, and even though only a few millimeters of precip. were forecast, it rained all week-end. On the Saturday I used a set of Specialized Clutch tires and was having a ton of fun sliding down the track, but as the day wore on, and the rain kept falling, the track got steadily muddier. I left the mud spikes at home as I thought there’d be no way I’d ever need to use mud tires at Bear. Wrong. Very wrong. I mounted the mud spikes on the bike on Sunday morning, and got to the race site early so I could get a good number of practice runs. Lots of racers were complaining about the conditions, but with the cut mud spikes on, I was having loads of fun. Some sections were getting really slippery, but I was still riding at good speed and hitting all the jumps right through till the end of practice. I was really looking forward to my race run all day. I lined up in the start gate and got ready to drop in. Everything felt right. I’d ridden really well all week-end and was certain I was capable of throwing down a strong run. I left the start gate pinned. I railed all my lines through the top section, and held great speed through the upper techy sections. As I traversed across the first flat the bike felt like it was rolling really slowly. I figured it was the mud, dug deep and pedalled hard. While the mud was thick, and slow, my progress was being thwarted by a tire that was swiftly going flat. Balls. I barely put a wheel wrong all week-end, have no flats, and I flat in my race run, in 3 inches of mud … how? Naturally I was gutted. Now I’m more motivated than ever!